Oil on panel, 71,5 x 102 cm. Sacra conversazione, which translates to Holy Conversation in English, is a motif in art history where the Madonna and Child are surrounded by saints in quiet, contemplative conversation or company. The baby Jesus has a vision of his future crucifixion. Although the Virgin holds her son, tenderly leaning her head forward to create contact, the child’s gaze is directed at something in the distance. The two saints stand prepared to offer support, but they too are distant in their gazes. To the right is Francis of Assisi, the ascetic monk, who mysteriously acquired Jesus’ stigmata on his own body. To the left is Saint Ursula in simple but noble dress. She also has a cruel fate in store – she and her following of 11,000 virgins were killed during their pilgrimage to Rome. In art history, the artist is known as Cima. He was popular in his own time, ran a larger workshop and worked for commissioners in both Venice and on the mainland, for the nobility, the bourgeoisie and religious brotherhoods. 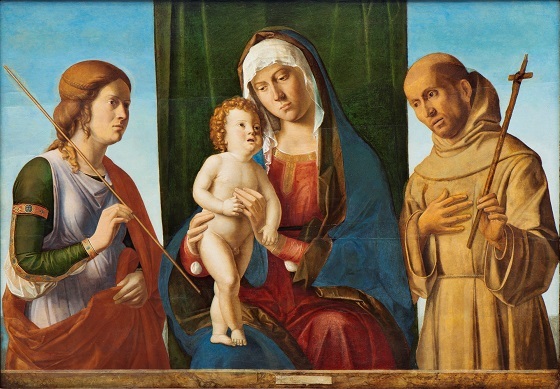 Cima’s style was influenced by Giovanni Bellini’s art in particular, but he maintained the figuration of the 1400s throughout his oeuvre, where sensitive and solemn Madonna images in a strong and warm palette were an ongoing theme.